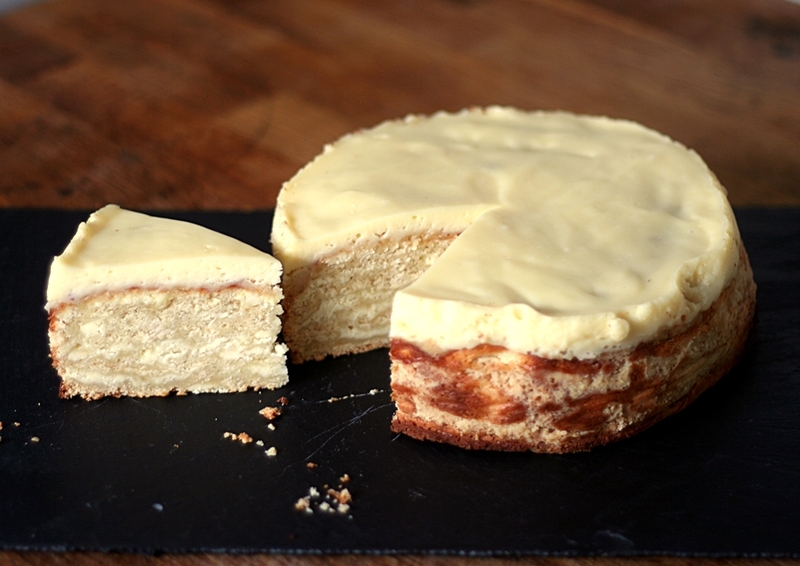 This recipe is a bit of an enigma – a DELICIOUS enigma! I found it while poking around in a Russian cooking blog, and even with Google Translate’s quirky services, it was so different and so unusual, I just had to give it a try. It’s quite unlike anything I’ve ever come across before, and seems to be that rare thing – a unique recipe (at least with this title), for I have been unable to find any variation of it at all, and I’ve searched in several languages! Amusingly, for all this talk of the unusual and unique, it’s name describes exactly what it is. But unlike the more usual crust-topped-with-rich-soft-cheese, it’s a cake-texture-tempered-with-curd-cheese-with-condensed-milk-soured-cream-topping cake. And it tastes AWESOME! The differences don’t end there either – instead of mixing the cake batter together, and pouring into the pan, the cake is made by building up alternate layers of wet and dry ingredients, and then baked in a slow oven for an hour. Finally it is topped with a sweet cream and condensed milk topping, sharpened with lemon juice. So what does it taste like? Like a cheese cake, to be honest. The ‘cake’ is like a firm sponge or madeira cake, but the sweetness and texture is tempered by the curd cheese layers to produce a crumbly, cakey mouthful that bizarrely (in a good way!) also tastes like cheesecake. It’s not an overly sweet cake, and I like that. I also love the fierce mix in the topping of the extremely sweet condensed milk and the sharp lemon juice *drools* My mouth is watering just at the thought – yum! You can buy curd cheese in the supermarket, or it’s very easy to make yourself using vegetarian rennet and whole milk. For this recipe the curd needs to be dry and crumbly, so however you obtain your curd cheese, drain it well in a piece of muslin and then press it with a weight for at least an hour to squeeze out the moisture. I’d love to know more about this recipe, so if anyone can fill me in, please do leave a comment below. Grease and line the bottom and sides of a 20cm loose-bottom or spring-form tin with baking parchment. Break up the drained curd by blitzing quickly in a food processor fitting with the cutting blade, until they resemble breadcrumbs. Whisk together the sugar, eggs and vanilla until light and frothy. Stir in the curd cheese. Set aside. Blitz the dry ingredients together in a food processor to crumbs. Scatter a layer (2-3tbs) of the dry ingredients in the bottom of the prepared tin. Spread a layer of the wet ingredients mixture. This will be quite tricky, because the crumbs will cling to the moisture, but persevere. It doesn’t matter if it’s not completely smooth and even. Repeat until both mixtures have been used up. Finish with the crumb mixture. Bake for about an hour, turning the tin around after 30 minutes to ensure even baking. While the cake is baking, mix the topping by whisking all the ingredients together. It will become quite thick. Test the cake for done-ness at 50 minutes, by inserting a toothpick or skewer into the centre of the cake. If it emerges free from liquid, then the cake is cooked. Remove the cooked cake from the oven and pour the topping over whilst it’s hot. Spread evenly. Return the cake to the oven and switch off the heat. Leave it inside the cooling oven for 15 minutes to ‘set’ the topping. Remove the cake from the oven and set aside to cool thoroughly. Serve as is, or with a dollop of whipped cream. Or lime. Or Seville Orange. Whatever takes your fancy. Whaaat, this cake is fascinating. I thought it was like tiramisu, but then it’s not, but then it’s not like bread pudding either! is that 500 grams pre-draining or after? It’s 500g drained curd cheese, so its the weight after draining. I know I’m a little late on the draw but is curd cheese the same thing as cottage cheese? And then how long do I let it drain. I’ve got it set up in cheesecloth and a sieve over a bowl. Tell me do… pretty please… where on earth do you get proper curd cheese from these days? Honestly? I make it myself using vegetarian rennet I ordered online. It couldn’t be simpler, and its much less stressful knowing all you need is a jug of milk, rather than worrying how many supermarkets you’ll have to gallop around. Hi, I’m a little confused on the measurements. Are the grams in weight only? I’m not good with baking metric. Yes, the grams are weight. It’s very straightforward with some digital scales.